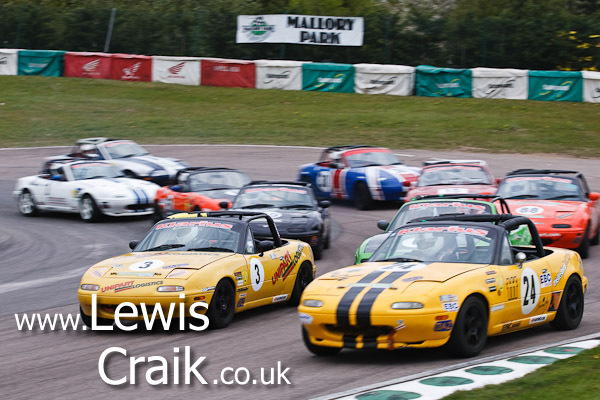 This was all organized a bit last minute, I heard about it on the Wednesday, but it wasn’t until Saturday evening that I was sure I’d be able to make it to Mallory Park. As the practice didn’t start until 12:30 and Mallory Park isn’t too far away I was able to get up at a civilized time, hit the gym and still make it to the track in time. Perfect. Mallory Park is great for photography, you are always fairly near to the track and there are only a few high crash fences. It is also possible to drive most of the way around the track, unless you are parked in the paddock, in which case you are stuck! For the practice session I was at the first corner, a long righthander called Gerard’s. There had been some work at this corner since my last visit to Mallory Park, this gave better access to the end of the start/finish straight, with the side effect of a nice clean watery background. Jonathan Blake and Alyn Robson stayed very close to each other through the practice, probably to get slipstreams, which worked well, as both placed high up the grid and it was also entertaining to watch! 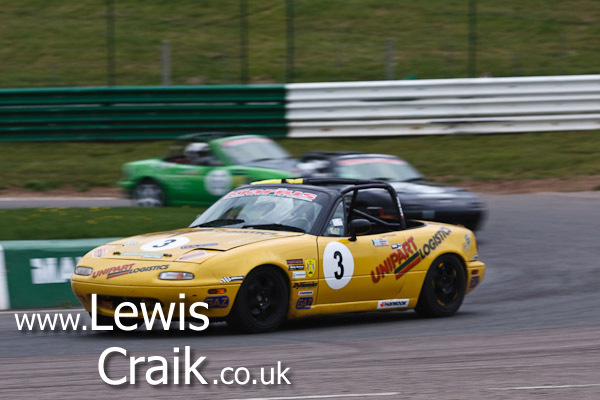 For the first Ma5da Race I drove round to the John Cooper Esses which give a few head on angles as well as some opportunities for side on panning shots with the cars riding the kerbs. 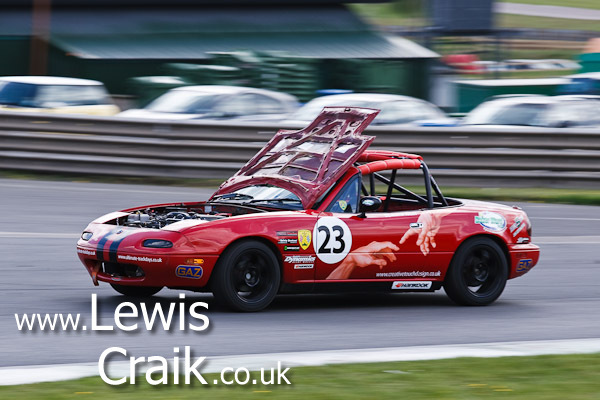 The strangest shot though, was seeing Martin Tolley coming round on his out lap with the bonnet flipped up over the windscreen. Doh! 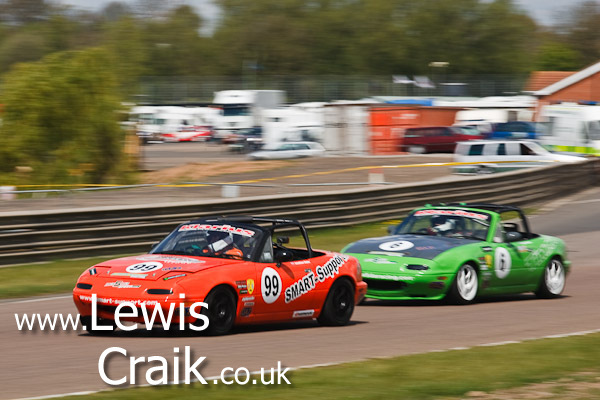 By the time the drivers got round to the Esses, Jonathan Greensmith had overtaken pole sitter Scott Kirlew, which was the order they finished the race. I’d been looking forward to the second race all day, as it was being run with a reverse grid, so lots of overtaking expected! I’d also saved my favorite angle for this race. The hairpin is the only slow corner on the lap, the spectator area is very close to the track and there is no catch fence. 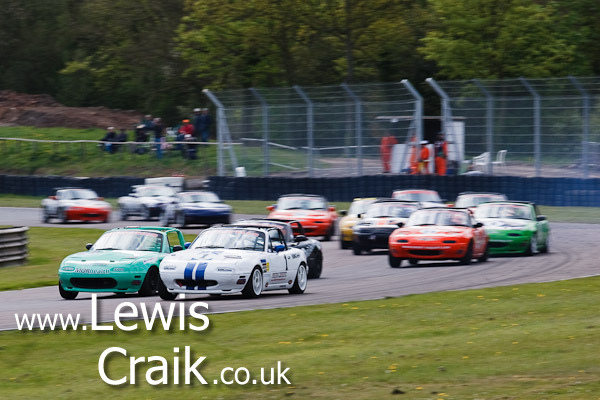 The first few laps the Ma5das were streaming round 4 or 5 abreast as the faster cars made their way to the front. Then the race calmed down (but only slightly) Jonathan Greensmith managed to pull away from the rest of the pack (17s on a sub 1m lap), however that was probably due to the 5 way battle for 2nd place which was eventually taken by Matt Robinson, with Carl Powell 0.097s behind him, despite being in front for most of the race. 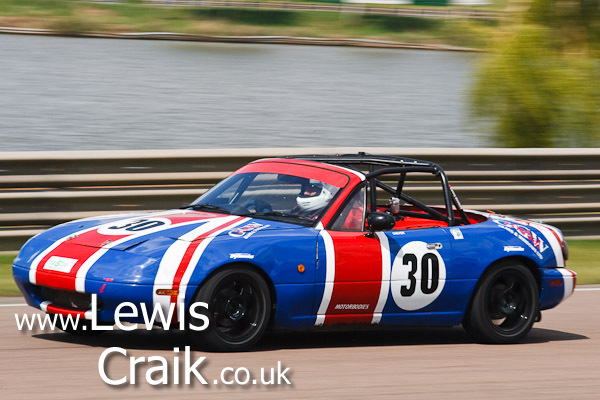 A special mention has to go to Wayne le Montais for the best paint job I’ve ever seen on an MX-5! Wayne le Montais - Love the paint job! 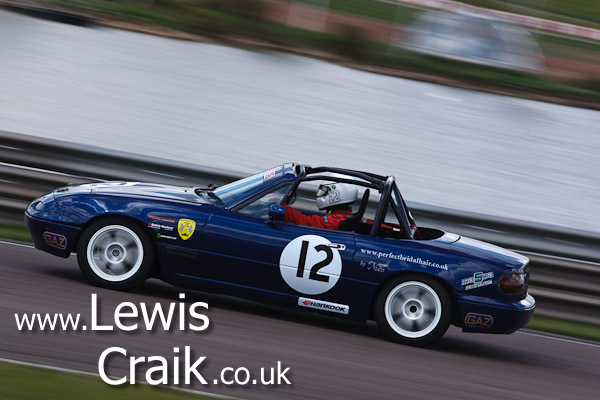 This entry was posted in Motorsport and tagged Ma5da Racing, Mallory Park, Photo by Lewis. Bookmark the permalink.